Conventional loans are growing in popularity thanks to low rates and increasingly flexible guidelines. A conventional loan is one that is not formally backed by any government entity such as FHA, VA, and USDA. Rather, it is a loan that follows guidelines set by Fannie Mac and Freddie Mae, two agencies that help standardize mortgage lending in the U.S. Conventional loans are also known as conforming loans because they “conform” to Fannie Mae and Freddie Mac standards. Does the lack of government backing make conventional loans less desirable? Hardly. While a conventional mortgage appeals to a wide demographic, it’s especially good for first-time borrowers with decent credit and some amount of down payment. It’s a myth that you need a 20 percent down payment for a conventional loan. From the ten-percent-down piggyback loan to the three-percent-down HomeReadyTM and Conventional 97 loans, conventional low-down-payment options not only exist but are extremely popular with today’s buyers. So, how do you qualify for a conventional loan? Simply by matching expectations set out by Fannie Mae and Freddie Mac. Once you do that, you join the club of conventional loan homeowners who make up about 65% of the market. The amount of the borrower’s down payment can affect the interest rate and final loan costs.. Private mortgage insurance, or PMI, is required for any conventional loan with less than a 20% down payment. What are conventional mortgage advantages? Like most loans, you have an option about how long you will be paying your mortgage. Conventional loans come in 15, 20, 25, and thirty-year terms. Some lenders even offer 10-year conventional loans. The shorter your loan term, the higher your monthly payment. Fortunately, a loan term of 30 years still comes with low fixed interest payments that help home buyers budget and cover the other costs of home ownership. Conventional loans are also a smart choice for those who know they won’t remain in their house long and want a shorter-term, adjustable-rate mortgage. This option comes with a lower interest rate than that of a fixed-rate loan. Adjustable rates are in fact fixed, but only for a period of time – usually 3, 5 or 7 years. During that initial “teaser” period, the homeowner pays ultra-low interest and can save thousands. The glitch here is that if they don’t sell at the end of the loan’s life, the rate adjusts — maybe down, but also maybe up. It’s a gamble that they should discuss with their lender and financial advisor. Another advantage to conventional loans is the lack of an upfront mortgage insurance fee, even if the buyer puts less than 20 percent down. FHA loans, plus USDA mortgages and even VA loans require an upfront “funding fee” usually between 1% and 3% of the loan amount. Conventional loans are actually the least restrictive of all loan types, in some respects. Conventional loans only require a monthly mortgage insurance fee, and only when the homeowner puts down less than 20 percent. Plus, that mortgage insurance cost is often lower than that of government-backed loans. USDA loans require the property purchased to be in a designated rural area. This is fine for those who live and work in suburban and rural locations. However, for those in major cities, a USDA-eligible home could extend commuting distance beyond what is reasonable. VA loans are exclusive to current and former military service members. They offer a lot of benefits, like zero down payment and no monthly mortgage insurance. But they are not available to the general population. First-time and repeat buyers can land a good value when they choose a conventional loan for their home purchase. And, more buyers qualify for this loan than you might expect. Conventional loans come with low rates that make home buying affordable. Rates are based on mortgage backed securities (MBS) which are traded just like stocks. And like the stocks, conventional loan rates change daily, and throughout the day. What’s the best way to secure a low rate? Watch market movements so you know a good rate when you see one. Conventional loan rates can drop — or rise — quickly when financial news hits the market. For instance, if the Federal Reserve decides to cut its benchmark rate, conventional loan rates could fall, too. Rates for 30-year fixed conventional loans have remained below 4.5% for some time, and rates are not expected to rise above that level in the near future. Still, the lowest rates are available to those who are ready to lock in when rates drop. Locking a rate is available to any approved applicant who has selected a property to buy. Short-term conventional loans come with very low rates. The most popular conventional loan lengths are as follows. Twenty and twenty-five year terms are also available from many lenders. Don’t rule out a conventional adjustable rate mortgage (ARM). These loans come with ultra-low rates for a period of typically 3, 5, or 7 years. They then adjust based on current rates. Today’s home buyers often choose a 5-year ARM or 7-year ARM. These loans can provide thousands in savings while giving the home buyer enough time to refinance into a fixed-rate loan, sell the home, or pay off the mortgage entirely. It pays to get at least three written quotes from different lenders, no matter which loan length or conventional loan type you choose. According to one government study, applicants who shopped around receive rates up to 0.50% lower than non-shopping home buyers. 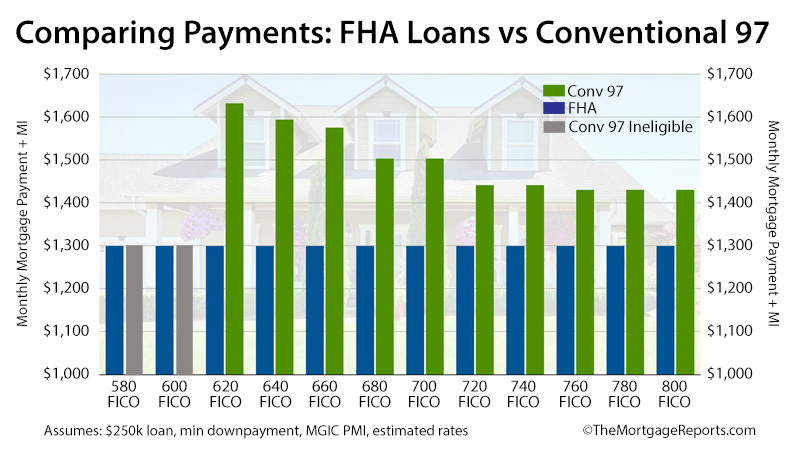 Conventional loan rates are heavily based on credit score, more so than rates for FHA loans. Fannie Mae and Freddie Mac publish Loan Level Price Adjustments which increase interest rates for lower-credit-score buyers. This is why an FHA loan is often more suitable for these applicants. For instance, a home buyer with a 740 score and 20% down will be offered about 0.50% lower rate than a buyer with a 640 score. It’s important to get a personalized rate quote. Published rate averages are often based on the “perfect” applicant — one with great credit and a large down payment. Your rate might be higher or lower. Get a conventional rate quote to based on your information, not on that of an average buyer. How do you qualify for a conventional loan? Conventional loans have a reputation of being too hard to qualify for. Elements of approval are the same as those for “easy” government-backed loans: you need to prove you make enough money, that your income is expected to continue, you have enough assets to cover the down payment, plus you have an adequate credit history. But it is true that lenders set a higher bar for conventional loan applicants than for other applicants — FHA buyers, for instance. Conventional loans have a reputation of being too hard to qualify for. That’s not the case. Conventional loans do not come with an implicit government guarantee that repays the lender if the buyer fails to do so. That comes with higher risk for — and therefore higher standards from — the lender. Still, home buyers shouldn’t be scared away and assume they can’t qualify. Conventional loan qualification is not difficult for the average home buyer. According to loan software company Ellie Mae, the average credit score for all applicants who successfully complete a mortgage is around 720. This is plenty high to get approved for a conventional loan. The minimum accepted score for most conventional loans is 620. “We want to know that people pay their bills on time and are financially disciplined and good at money management,” says Staci Titsworth, regional vice president sales manager with PNC Mortgage in Pittsburgh, Pa. A slightly higher score may pass the credit-score test, but necessitate a higher interest rate to compensate for the greater risk. Applicants with lower credit may want to choose an FHA loan, which does not charge extra fees or higher rates for low credit scores. Above and beyond credit, approvals will be issued to applicants who can provide proof of earnings which may involve some or all of the following documentation. “Most lenders require a two-year documentation to show a consistent earnings stream,” Titsworth says. Maintenance, also termed alimony, can also be counted if documented in a divorce decree, along with the recurring method of payment such as automatic deposit. Seasonal income is also accepted, again with proof in a tax return. The lender will likely insist that the house itself be a reasonable risk, documented by an appraisal that values the house at or above the selling price. If not, use the appraisal as a bargaining chip to get the seller to come down in price. The lender’s maximum loan amount is based on appraised value if it is lower than the purchase price. This could leave the buyer to come up with extra cash, or choose another property. For instance, a home is offered at $200,000. But it appraises for $190,000. The applicant must come up with his or her down payment plus an extra $10,000 to cover the shortfall. Or, the seller can come down in price. Value isn’t the only thing to watch for when getting a convention loan appraisal. Sometimes, during an inspection the appraiser may require another professional’s opinion. “If the appraiser sees water stains or a lot of leaky faucets, he may request a plumbing inspection. The seller may need to make improvements, which could delay a closing,” Titsworth says. However, conventional loans actually come with less strict appraisal and property requirements than do FHA, VA or USDA loans. This is another advantage to conventional: you can qualify for a home in slightly worse condition and plan to make the repairs after your loan is approved and you move in. The amount of the borrower’s down payment can affect the interest rate and final loan costs. Putting down a larger amount means that the monthly mortgage costs will be less. A payment of at least 20 percent will eliminate mortgage insurance, a requirement of the FHA and USDA loans even with a large down payment. 5% down with PMI (Conventional 95) One loan at 95% loan-to-value. PMI required. Conventional 97 3% down. No income limits. HomeReady™ 3% down. Must be at or below the geographical area’s median income unless home is located in underserved area. 90% loan One loan with 10% down. PMI required. Home Possible Advantage 3% down loan with income restrictions. Offered by Freddie Mac home lenders. Down Payment Gift Applicant may receive any percentage of the down payment as a gift from family or other eligible source. Many conventional loans are made with as little as 3 percent down. The HomeReadyTM mortgage program is one such option. It allows non-borrowing members of the household help the actual loan applicant become approved. Lenders will consider the income of mothers, fathers, extended family, and even that of non-married household members, even when they are not officially on the loan file. The Conventional 97, as the name suggests, allows home buyers to borrow ninety-seven percent of the home’s price. Unlike the HomeReadyTM option, these loans are available to applicants at any income level buying a home in any location. The drawback to a 3% down loan is that the interest rate may be higher to compensate for the smaller amount down. Mortgage insurance may be more expensive as well, as compared to a five- or ten-percent down conventional loan. The piggyback 80/10/10 loan option lets the applicant skip the full 20% down payment and mortgage insurance. The applicant applies for a first mortgage for eighty percent of the purchase price. Simultaneously, he or she opens a second mortgage, such as a home equity line of credit (HELOC) for 10% of the purchase price. Then, only ten percent down is required. The lender allows the borrowed ten percent loan to “count” toward the applicant’s down payment. The amount down, then, is considered twenty percent in this case, removing the need for mortgage insurance altogether. A conventional loan borrower has the option to put anywhere from three to 20 percent down or more. Plus, a down payment gift can cover the entire amount down in some cases. Check with your lender for gift and donor documentation requirements. Without a gift, the applicant will need to verify a valid source of the down payment such as a savings or checking account. Applicants can liquidate investment accounts and even use a 401k loan for the down payment. Typically, home buyers will need to supply a 60-day history for any account from which down payment funds are taken. PMI rates vary considerably based on credit score and down payment. For instance, one PMI company is quoting the following rates, as of the time of this writing, for a $250,000 loan amount and 5% down. Another factor that might affect your PMI rate: the mortgage insurance company itself. Many PMI companies exist, and your company is usually chosen by your lender. However, you do have some say in the choice. If you know a particular PMI company that offers the best deal, ask if your lender works with them. If not, the lender may be able to provide a similar offer from a different PMI provider, or you can choose a lender that works with your chosen mortgage insurance company. Nationwide conventional loan limits stand at $453,100 and go higher in many locations. For instance, Fannie Mae and Freddie Mac allow a loan amount up to $679,650 in Los Angeles County, California. Home buyers who need a loan amount above the standard limit should check for the specific limit for their area. The potential buyer’s debt-to-income ratio also plays a factor since it, too, can reveal good or poor financial prudence. When it comes to buying a house, lenders factor in all debt to determine the total mortgage payment, including the loan, home owner’s insurance, and real estate taxes. Many lenders want this ratio to be less or equal to 36 percent of the borrower’s income, says Sam Mischner, senior vice president, sales and client management for Lending Tree in Charlotte, N.C. But many lenders will issue loans up to a forty-three percent debt-to-income ratio, the limit set by recent federal legislation. With a good credit score, you can qualify for more house and a bigger payment than you probably think. Closing costs will involve fees such as a lender’s origination fee plus vendor fees like the appraisal, title insurance, and credit reporting fees, says Titsworth. Check whether your chosen lender offers lender credits, and make sure any seller contributions are within Fannie Mae and Freddie Mac guidelines. Typically, sellers and other interested parties can contribute the following amounts, based on the home price and down payment amount. When buying a rental or investment property, the seller can contribute only two percent with any down payment amount. There are dozens of mortgage loans available to home buyers today. In general, though, mortgages can be divided into two broad categories — government-backed loans and conventional loans. Government-backed loans are loans for which mortgage lenders are protected against loss via government insurance program. The most common government-backed loan is the FHA loan, which is insured by the Federal Housing Administration. FHA loans got their start in 1934, and helped to reboot the U.S. housing market after the Great Depression. FHA loans worked so well that the Department of Veterans Affairs sponsored a similar program for military personnel returning from war in 1944. With the creation of the G.I. Bill that year, the VA Home Loan Guaranty program was established, which guaranteed lenders against loss on mortgage loans made to veterans. Then, the USDA Rural Housing Program was launched. Meant to help home buyers settle less-populated parts of the country, the U.S. Department of Agriculture launched its flagship 100% financing program and provides insurance to lenders making USDA loans. By contrast, conventional loans are not backed by the government. Conventional loans are backed by Fannie Mae and Freddie Mac, and these two agencies exist solely to help banks make mortgage loans. They offer no mortgage insurance to lenders, leaving that task to private mortgage insurance (PMI) companies. In today’s market, conventional mortgages account for more than half of all mortgage loans made; and, according to conventional mortgage guidelines, PMI is required when a borrower’s loan-to-value is above 80% (excepting for the HARP mortgage refinance). This is likely why buyers think you have to put 20% down on a home. 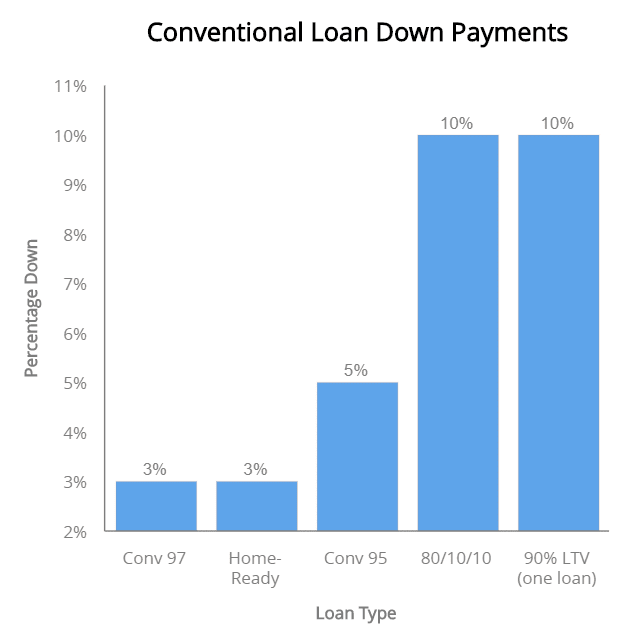 Conventional loans are the most prevalent of all loan types and PMI comes into play with down payments of less than twenty percent. People seem to think PMI is a waste of money. PMI is not a waste of money. Because of PMI, renters can more easily transition into home ownership. PMI makes low-down payment loans possible. The bottom line is that it’s very important for home buyers to shop around for a conventional mortgage with at least three lenders. Today’s rates are very low, and can be even lower with the right shopping practices. Get an eligibility check for your conventional loan, or see if another loan type is right for you. Verification can be obtained in minutes, and no social security number is required to start.